The BR 03 Desert Type was designed to meet the specifications of air forces operating in warm countries. Therefore, it is sandcoloured, just like the outfits worn by pilots on desert missions. 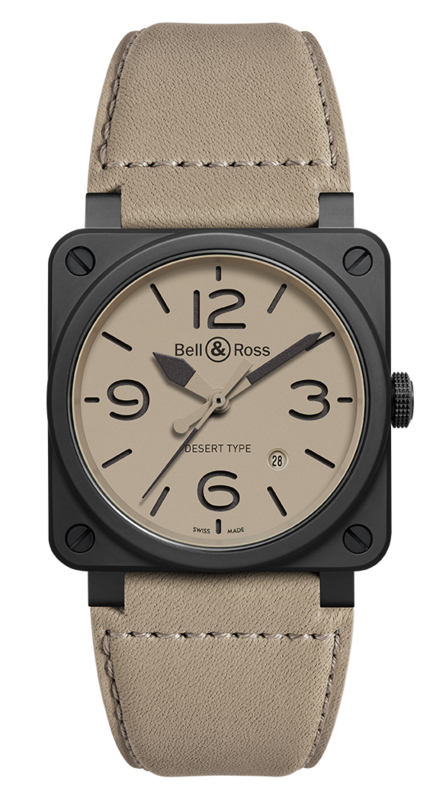 An inherently professional instrument, the BR 03 Desert Type perfectly illustrates the four fundamental principles of Bell & Ross: legibility, functionality, precision and water resistance. Just like analogue aviation counters, the shape of the hands and the typography of the numerals guarantee total ease of reading. Meanwhile, the dial's design is inspired by military techniques of marking for maximum legibility. Formed by two overlapping inserts, the beige upper section is cut away around the numerals and indices, revealing the black photoluminescent coating covering the lower insert. This black and sand-coloured contrast provides optimal reading of the dial during the daytime, as well as equally remarkable legibility at night thanks to its consistent and masterful photoluminescence. Case: 42 mm in diameter. Matte black ceramic. Dial: beige. Superluminova-filled numerals, indices and hour and minutes hands. Straps: beige calfskin and ultra-resistant black synthetic fabric.